"ALLS" stands for Ada Louise Ludeke Smith: Ada Ick in childhood, Ick at college, Icky to her husband, Mom to her daughters, Louise to her in-laws, Momine or Grandma or Goppy to her grandchildren and great-grandchildren, and Smitty as a senior citizen. Her informal memoirs were written 1983-96. Mellie Morris Smith, the only child of Herbert Gustavus Smith and Deborah Ellen Hedges, was born Mar. 6, 1885 in Topeka and appears as "Baby Smith" in that month's Kansas state census. "She was named for her Mother's best friend in Urbana, Ohio," ALLS would report—a Melanie often called Mellie. The 1880 census sheds no light on who this might be; then and afterward, the name "Mellie" was overshadowed by a preponderance of "Nellies," and was itself often entered or transcribed with the initial N—as would frequently happen to Mellie Morris Smith. 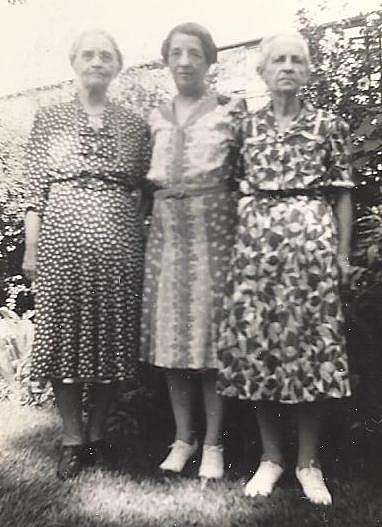 After the family's return to Urbana and mother Debbie's death in 1887, Mellie was raised by her Hedges Aunties. They requested that eight-year-old Mellie stay on with them after her father H.G. married Mila Burns Callison in 1893; and Mellie remained at 436 South Main while attending Urbana High School and Urbana University (the latter just a few blocks west of home). Urbana University had been founded in 1850, partly at the urging of Swedenborgian missionary John Chapman—better known to history as "Johnny Appleseed"—and which, after Oberlin, was the second institute of higher education in Ohio to admit women. The 1904 city directory gives Mellie's occupation as student; two years later she would be listed as teacher. "She taught in local elementary schools for a number of years," ALLS would say; "then decided she preferred to be a librarian, so enrolled in the University of Iowa... and for a time worked in the University Library in Ames." Actually Mellie attended the Drexel Institute Library School in Philadelphia from 1908 to 1909; after obtaining her certificate there, she went to Iowa as an assistant cataloger. The Feb. 1911 Library Journal noted "Miss Mellie Smith, [Drexel Class of] '09, has been promoted to the position of head cataloger at the State College Library, Ames, Iowa." By 1913 she returned to Ohio and a job at the Cincinnati Public Library. Her name appears as a member of the Cincinnati Women's City Club as late as Jan. 1917; later that year Mellie moved on to become librarian at Toledo University, a position she enjoyed. Toledo U. 's archives mention that "Miss Mellie M. Smith was appointed 'acting librarian' in 1917 and served the university for four years. Miss Smith came to the University from the Cincinnati Public Library where she had been a senior assistant cataloger and reference librarian." Mellie did postgraduate study at the New York Public Library, 1920-22. "One summer, Edgar King (head librarian from Miami University) was enrolled there also, and they became friends. At that time he needed an assistant librarian, and offered her the position. She was happy to go to Ohio, and accepted the offer gladly," spending the rest of her professional career (1922-1946) at Miami in Oxford OH. Before starting work, Mellie appeared in The Torch: A Pageant of Light from the Early History of Urbana, Ohio by Alice Archer Sewall James, presented in June 1922 on the Urbana University campus. Mellie played a World War Mother during the pageant's recessional, during which (according to the program, viewable at Google Books) "the audience is to remain seated until after the Epilogue is spoken." During her Oxford years Mellie "lived in many different apartments, and was always very happy enjoying close friends, belonging to different literary clubs, and eventually joining the D.A.R." (in 1925: ID number 81708). "One summer she went to Europe for several weeks, and I never did understand how the Aunts ever permitted her to do that." In an earlier, chattier memorial, ALLS said Mellie "had a European vacation... (England—Scotland—France—Italy etc.)... F.S.S. was amazed that 'the Aunties' gave their consent to her going!! (so far away—Ha!) She had always been treated as their 'little girl'—even after grown up and on her own!!" ~a's database of New York Passenger Lists shows "Smith, Mellie, [age] 41" among those aboard the S.S. Republic, sailing from Southampton on Aug. 25, 1926 and arriving in New York on Sep. 4th. West Hall was a Miami dormitory built as a temporary structure in 1919; it would remain in use for over forty years. One of the co-eds who came back in Fall 1926 (from Hamilton, not Dayton) was Ada Louise "Ick" Ludeke—ALLS herself. She would report that as a house mother, Mellie "handled many problems there with diplomacy. She was strict usually, gaining the title of 'Library Bouncer.' She was usually very calm and quiet, but a temper erupted every once in awhile." And Mellie began matchmaking efforts for Ada Louise. "She tried valiantly to interest me in dates," ALLS would say: one "an uninteresting character" employed in the library; another Mellie's cousin Lester Smith, son of her Uncle M.L. "To keep peace, I did go with him one evening to Columbus, Ohio—an extremely boring time for me. But, bless her, she finally accomplished her goal by introducing me to her brother one summer." ALLS's courtship and long-distance elopement with Francis See (F.S. or Frank) Smith is covered in Chapter L-6. "Mellie Smith met me at the Hotel in Hamilton, Ohio on Jan. 23, 1930, and we drove in her car to the Cincinnati Railroad Station. We said our tearful goodbye, and her last words were, 'I wonder if I should have introduced my brother to you in August of 1928.' I assured her it was for the best, and thanked her for being so wise." While I lived in Springfield [OH: 1926-30] I don't remember seeing Aunt Mellie other than sometimes at Christmas, and perhaps once during the summer. At Christmas, after all the food was consumed, dishes done etc., the Christmas games were played by all. Then Aunt Mellie would gather the younger children about, and read to us until it was about bedtime. One of our summer treats was when F.S.S. would come back [to Ohio] on vacation and we went to Urbana to the Hedges home for a wonderful dinner... In later years, after [ALLS] and F.S.S. were married, I saw much more of Aunt Mellie—both in Ohio and Missouri. Spent one vacation of about a week in Oxford (I must have been about fourteen )—she had a lovely, small apartment, full of good books... She introduced me to some of the people about my age... I met one girl I was very fond of—and dear Auntie took us both to Cincinnati one Sunday. We were driving up to see the new railroad station—the entry one way, exit the other, with a large grassy mall between. We were stopped by a police officer, [entering] on the exit. [Aunt Mellie] very coolly explained she didn't see the sign, and of course he very gallantly escorted us on ahead to the station, with very gentle instructions as to our proper exit. No ticket! In 1925 she bought a secondhand Chevy in Urbana, and was taught to drive it one weekend. This made it easier for her to travel to Cincinnati on weekends, and also to get to Urbana. This car needed repairs too often, so she sold it to Ed Earsom (Aunt Alice's husband) in 1928. She then bought a new Pontiac in Oxford... She was a fairly good driver, but soon earned a reputation in Oxford of causing many minor accidents. Someone told me, "When we hear broken glass, we usually see Miss Smith involved." She had one maddening habit while driving: if she came to a "sticky" situation, she would stop and announce, "I just can't do this, please help me." Unfortunately, I was usually the unlucky person to get out of the car, go around to the driver's side (with honking horns from other angry drivers) and get the car going again... She seemed to collect tickets from different cities... In Urbana one Saturday a.m., Mellie, Aunt Alice, and Jeanie drove downtown to shop. [Mellie] couldn't find anyplace to park, so just chose an empty spot. When they returned to the car a half hour later, a ticket was behind the windshield wiper, informing [Mellie] she had parked in a No Parking Zone, and please appear at City Hall. They did, and Mellie vented her anger to anyone nearby. She had to pay a fine naturally, but when they entered the Hedges home, Jeanie announced, "Guess where we all were? In Jail, and it was fun." She was wearing Aunt Alice's large-brimmed blue straw hat, and it was plain to see she was the only happy one in the group. It was a big treat to visit the elder Mellie in Oxford, her apartment smelling of lavender soap; and a bigger treat when she'd come to Kansas City, getting off the train "like Marion Lorne" toting paper sacks full of interesting things—which made F.S. exclaim, "Oh Sis! what have you done now??" Mellie was a great giver of books, several of which remain in Ehrlich collections; at other present-giving times, the postman would bring Jeanie "mysterious-looking packages" from Mellie that contained coordinated outfits. "She was opinionated, with a short fuse, wanting no arguments, and had a tendency to flare up"—becoming infuriated when somebody took her favorite seat in the movie theater; squabbling one Christmas with Aunt Lou Hedges, whom she suspected of pilfering the "nicer" of what in fact were identical pairs of holiday lingerie. In 1943 during a routine physical checkup, Mellie was told she had a mild case of angina pectoris, and was given medication to control [its] progress. She felt well, and continued working in the library, and enjoying living in a new apartment. But Aunt Mamie Hedges had died, and Uncle Ed Earsom also [on Sep. 2, 1945], and housekeepers caring for Aunt Alice were not working out well. Mellie went to Urbana each weekend, and finally realized she would have to live [in the Hedges home] to solve the many problems that existed there. She retired from the library in 1946 and moved to Urbana. This helped in many ways, but not in caring for her own health in the best way. It was necessary to climb a long flight of stairs to get to the bathroom and bedrooms, and caring for Aunt Alice also was too much of a burden. A woman was finally hired to do the cooking and cleaning, and other duties. Aunt Alice was failing mentally very fast, and also was falling often. The worst scare was her leaving the house one November cold night, wearing a flannel nightgown, winter coat and hat, but no shoes. The attendant in an all-night filling station, four blocks from home, saw her and took her into the warm station. She refused to answer questions, but he found her name and address in her purse. He called the police station to report the incident. They took her home in their car, and when the doorbell rang about 4 a.m. and Mellie opened the door, she almost fainted. Auntie was put to bed with hot water bottles, but she didn't even get a cold from that bad escapade. Mellie refused to put her into a nursing home, and unfortunately her own health deteriorated. Auntie finally died on July 23, 1949 [and was buried at Oak Dale with the Hedges in Section 61—Lot 1, apart from husband Ed Earsom and his first wife Flora in Section 42—Lot 24]. We invited Mellie to sell the home and move to Kansas City to live with us. I had an interview with Winnie Dana, the director of a lovely retired women's home that was maintained by the Linwood Presbyterian Church. But unfortunately they did not permit out-of-state residents. By then, Mellie had made arrangements to live in the Bethesda Convalescent Home in Cincinnati, and we couldn't change her mind. Her lawyer assumed all the business arrangements to sell the home, and Mary Saxby (Uncle Ed's daughter) came from Detroit to assist in selling all extra furniture, etc. I have been intending to write you since being here at this Methodist Home but haven't gotten around to it. After Auntie's death last summer, I was entirely alone and unable to take care of myself, so came here. I am liking it very much. I don't do much but eat and rest. I have been quite comfortable since being here but not able to get around—feel unsteady on my feet. It is very pleasant here and I have complete maintenance and care. It is hard to think of Jeanie graduated from High School and going to college. I still think of her as that little girl I used to wheel around in a go-cart. Write me when you can. How are you and the family? Four days after completing this letter, Mellie Morris Smith died aged 64. MISS MELLIE SMITH DIES IN CINCINNATI. Miss Mellie Smith, cataloguer at the Miami university library from 1922 to 1946, died suddenly Tuesday at the Bethesda home, Cincinnati. She had been in poor health for three years, but her death was unexpected. Miss Smith resided in Urbana, O., with an aunt, in recent years, until the death of her aunt last fall. While living in Oxford she resided at the Campus Gates Manor. Burial will be Thursday morning at 10:30 o'clock in Urbana. SMITH SERVICES TODAY IN URBANA. Services were held in Urbana Thursday for Miss Mellie Smith, cataloguer at the Miami university library from 1922 to 1946, who died in the Bethesda home in Cincinnati on Tuesday after three years of illness. She was born in Topeka, Kan., and taught school before she attended Drexel Institute library school in Philadelphia from which she obtained a certificate in 1909. Until she studied further library work at the New York Public Library in 1920 she was with libraries at Iowa State College, in Cincinnati and at the University of Toledo. MISS NELLIE [sic] M. SMITH. Miss Nellie M. Smith, 64, a former resident of Urbana, died at 2:20 a.m. Monday in the Bethesda Home for the Aged in Cincinnati. She entered the home in August 1949. Born in Topeka Kan., March 6, 1885, she was the daughter of Herbert and Deborah Hedges Smith. She was a member of the Methodist Church of Urbana. She served as librarian at Miami University, Oxford, for a number of years. The only survivor is a half-brother, Francis M. [sic] Smith of Kansas City, Mo. The body was brought to the Humphrey funeral home here for services at 10:30 a.m. Thursday with the Rev. Stanley Jeffrey, pastor of the United Methodist church, officiating. Burial will be in Oak Dale Cemetery. Mellie's pallbearers included her brother Francis, cousins Clarence and Lester Smith, and Robert Fee (son of Nellie Hedges Fee; grandson of the Rev. William I. and Sarah A. Fee). She was buried with her mother Debbie at Oak Dale, where they share a single marker. ● On one list of Drexel Institute Library School's Class of 1909, Mellie's name appears directly above that of Cassandra Updegraff Warner, graduate of Kansas City MO's Central High School. By 1913, this splendidly named lady (born 1873) would be Head of the KCMO Public Library's reference department. She moved to Florida by 1922 and died there in 1960. ● "Nellie M. Smith" appears in the 1910 census for Ames IA; ditto 1920's for Toledo. In 1930's for Oxford OH she is "Nellie N. Smith," lodging at 417 East High with Pearl Harris, manager of a Miami dining hall. She reverts to Mellie Smith in the 1940 census, lodging at 322 High Street with teacher Mary Willcockson—but here Mellie's shown as Ohio-born, and aged 41 instead of 55. Her salary as Miami librarian was $1900, and her education "C-4"—four years of college, indicating she did not in fact earn a master's degree from Columbia in New York (as ALLS said). ● "Alice Archer Sewall James—known affectionately as 'Archie'—lived a life most women of her time could only dream about," says a Swedenborg Foundation Press blurb for Stay by Me, Roses: The Life of Alice Archer Sewall James, 1870-1955 (found at ~swedenborgpress). "She grew into an irrepressible woman who never stopped looking for ways to pass her experience on to others." After travels through Europe and a "challenging" marriage, "in later years—like the roses in the title poem—Archie reemerged as an artist and teacher, inspiring a new generation of painters at Urbana University." Three of her books (including The Torch: A Pageant of Light, from the Early History of Urbana, Ohio) were available from Amazon.com in 2012. ● In 1937 Mellie (then aged 52) came to Kansas City MO for a library convention—accompanied by Aunt Alice Earsom as "chaperone." ● Mary Helen Pooley (1890-1976) is listed directly before Mellie Morris Smith in a 1913-14 list of the Cincinnati Public Library's Cataloguing & Reference staff. By 1917 Mary Helen was librarian at Cincinnati's Hughes High School; her article "Problems Met in Re-Organizing a High School Library" was published in the Nov. 1917 Library Journal, following presentation at the General Meeting of the American Library Association. She and sister Nola I. Pooley (1899-1979) were the daughters of Martin Pooley (1863-1930) and Fanny Campbell (1867-1944) of Kingston, Luzerne County PA. All four are buried at Luzerne County's Wyoming Cemetery (as per ~g). Copyright © 2003-2015 by P. S. Ehrlich; All Rights Reserved.